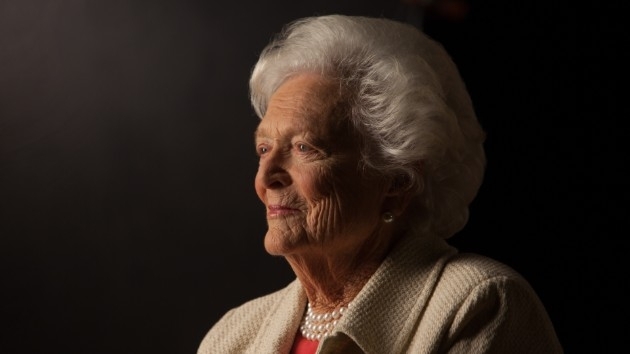 "I don’t understand why people are for him,” Barbara Bush said of Donald Trump in one interview, expressing particular astonishment that women could support him. (WASHINGTON) — A new biography of former first lady Barbara Bush details her deep and prolonged distrust of Donald Trump and her bewilderment at his unlikely rise to the White House. The Matriarch: Barbara Bush and the Making of an American Dynasty, was written by USA TODAY Washington Bureau Chief Susan Page, who interviewed the former first lady frequently during the final six months of her life and was given access to her personal diaries. In an excerpt of the book, which will be published April 2, Bush explained her estrangement from the GOP in the era of Trump. Bush, who campaigned for her eldest son, Jeb, during the 2016 presidential primary, told Page in a February 2018 interview, just months before her death, she didn’t consider herself a part of today’s Republican Party, a stunning admission from one of the most recognizable faces of the GOP in the latter half of the 20th century. As she continued to witness Trump’s success, Bush said she began to see a party she could no longer support, even as members of the Bush family like her grandson George P. Bush, commissioner of the Texas General Land Office, remained in public office. “I don’t understand why people are for him,” Barbara Bush said of Trump in one interview, expressing particular astonishment that women could support him. Bush, who was married to former President George H. W. Bush for more than 70 years until her death last April, also disclosed that George W. Bush voted for Hillary Clinton in 2016 — the first time he’d ever supported a Democrat, she said — and that she wrote in Jeb Bush’s name on her ballot. The former first lady later had to grapple with Trump’s rise to the nation’s highest office, describing a phone call between her husband and Trump the morning after the 2016 election. Bush also wrote a letter to first lady Melania Trump in which she expressed her surprise that it was not addressed to former President Bill Clinton, who would have been the nation’s first non-female presidential spouse had Hillary Clinton defeated Trump. “The world thought I was writing this note to Bill Clinton. I am glad that I am not. I wanted to welcome you to the First Ladies very exclusive club,” Bush wrote in her letter to Melania Trump. “I woke up and discovered, to my horror, that Trump had won,” Bush recounted. In the final months of her life, Barbara Bush did not hide her discontent with the 45th president, keeping close to her side a gift given to her by a friend. According to Page, the clock stayed on Bush’s bedside table or next to whatever chair she was sitting in until the day she died.